LG’s smartphone business still continues to lose money at an alarming rate. The Korean firm cut its losses in its Q4 2017 financial period to minus RKW 213.2 billion ($192.33 million), up from KRW 375.3 billion ($331.37 million) in the previous quarter, but there’s is no sign that things will drastically change anytime soon. That mobile division wrapped up its financial year with total sales of KRW 11.67 trillion ($10.52 billion) which is down slightly from 11.71 billion for 2016. That is an improvement on 2016, which saw a 10.8 percent year-on-year sales drop versus total sales in 2015. LG cited “a challenging marketplace and strong competition from Chinese brands” as primary factors behind its struggles over the past year. You’d imagine that Oppo, Vivo, Huawei and Xiaomi — which have mopped up marketshare across the Asian market with competitively-priced attractive mid-range devices — are the specific companies referenced here. Looking at its own devices, LG said the LG V30 sold well alongside unnamed premium smartphones. Onward to this year, Mobile World Congress is next month and it’ll give us a glimpse at what devices and tricks newly appointed LG Mobile CEO Hwang Jeong-hwan — who spent time in its R&D division — is pinning a revival on. Outside of mobile, the story is different: LG as a whole is prospering. Its full-year profit of KRW 2.47 trillion ($2.23 billion) is the most it has made annually since 2009. That’s principally down to its home appliance and TV divisions, with LG’s home entertainment division seeing its operating income for Q4 rocket by 134 percent to hit KRW 383.5 billion, around $345.96 million. 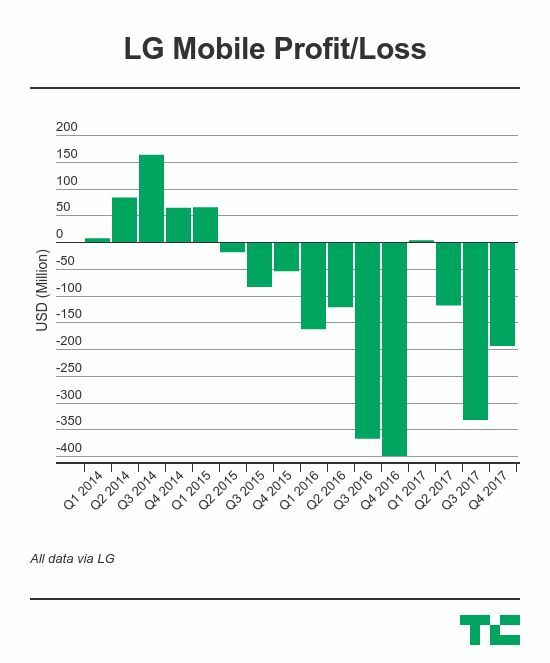 The success of its other units does make you wonder how much longer LG will tolerate its loss-making smartphone business. There’s plenty of precedent to trimming the focus or removing it altogether. Sony’s decision to reduce its mobile efforts in recent years removed what were once big losses for its business, while HTC — which doesn’t have other profitable units to fall back on — was forced into selling a large chunk of its smartphone business to Google to stay afloat.